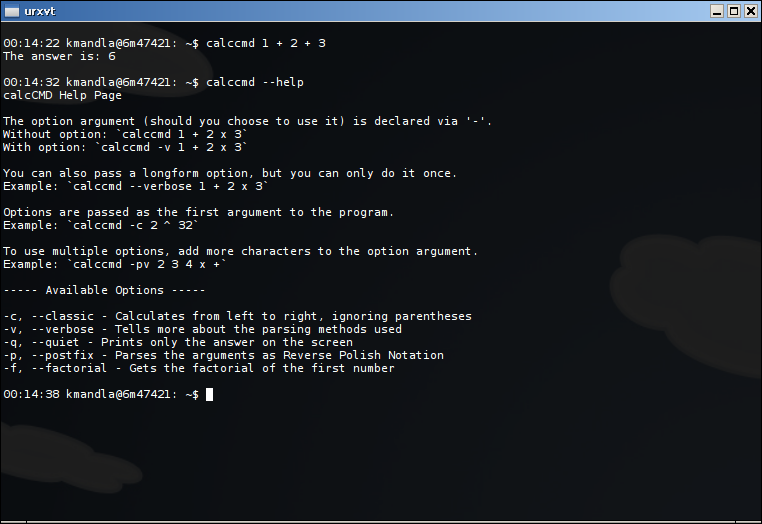 c is an RPN calculator, and if you don’t know what that means, it might be a very confusing experience for you. c is somewhat helpful to newcomers though, since its registers are clear at every operation. Put the values you want inside, press the key for the operation, and as you can see, the result is kept in the lowermost register. 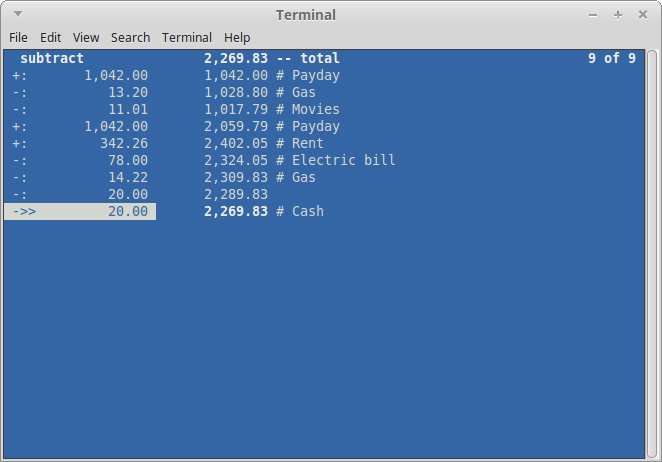 calcc is similar to c in its captive terminal approach, and has a style somewhat like bc or other calculators, with each line interpreted and calculated at once. Its results are what set it apart; calcc saves you the step of converting your answer between bases or formats, and displays everything at once. 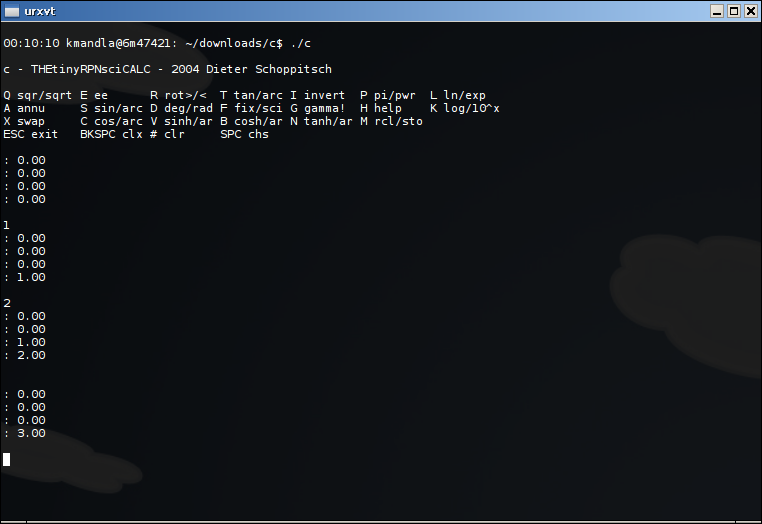 So you won’t need a date converter or a base converter to supplement calcc. If you need a legend for what each column is, there is a text file in the source package that explains which is ASCII, which is base 32, base 64, and so forth. Very convenient. The last one today is calccmd. calccmd is the only one of these three to send your calculations through as command-line arguments, and I’ll be honest and say there are times when I would prefer that approach. Sometimes I don’t want to fire up all of bc just to divide two numbers, and allow for two decimal points. This entry was posted in Linux and tagged calculator, math, mathematics on 2015/02/20 by K.Mandla. 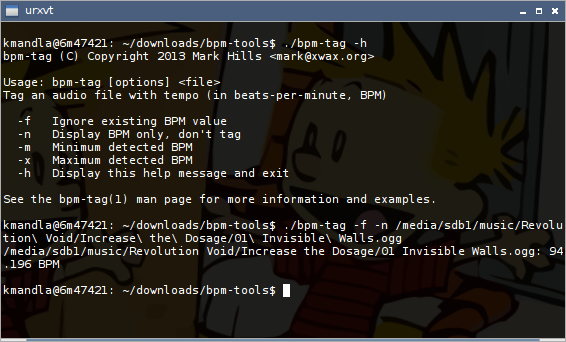 I like tools that do simple things in obvious ways. I like tools that have color too, but sometimes I’m willing to forgive that, and award points on cleverness. 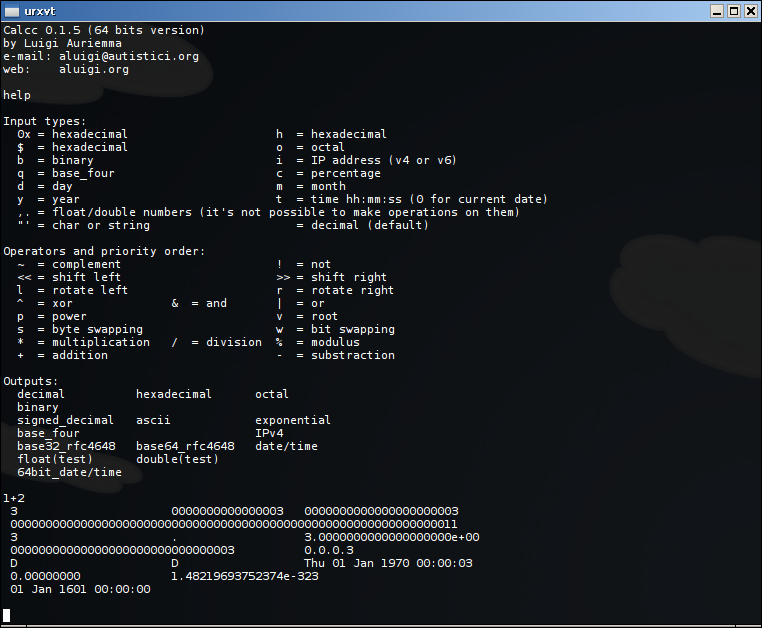 Here’s datamash, a GNU tool, doing something fairly straightforward. Forgive my rotten formatting. I was trying to line up the sums under their appropriate columns, but I ran out of patience with it. What you should see there are two arbitrary columns of numbers, and datamash summing both on the fly. It’s not a terribly earth-shattering function, but it does make a lot of otherwise tricky number functions accessible to flat numeric data files. So you don’t have to import into a spreadsheet to get a sum, a mean, a max, a min or whatever. 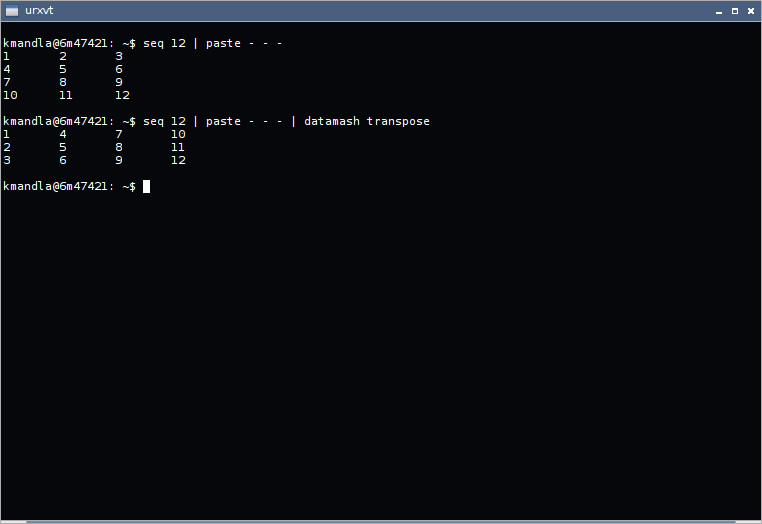 So you can feed datamash a series of columns vertically, and it will run them out horizontally. Omigoshthatissocool. datamash is in AUR and testing/unstable. I don’t know why it’s not in the standard repos for either distro, except that it may be too new. The development pages for datamash suggest it started about a year and half ago, but saw most of its activity within the past six months. Give it time. A lot of what datamash can do — particularly the higher statistical functions — are much more than I would need on a day-to-day basis. But if you keep something like r or octave on board for regular data analysis, you might consider datamash as a lighter alternative. This entry was posted in Linux and tagged calculator, data, math, mathematics, statistics on 2014/10/02 by K.Mandla. I’m going to lump ipcalc and pipcalc together today, for reasons that are probably immensely obvious just from looking at their names. And since neither one takes up much screen space in its default form, I can squish them both into one screenshot. And there you have it. 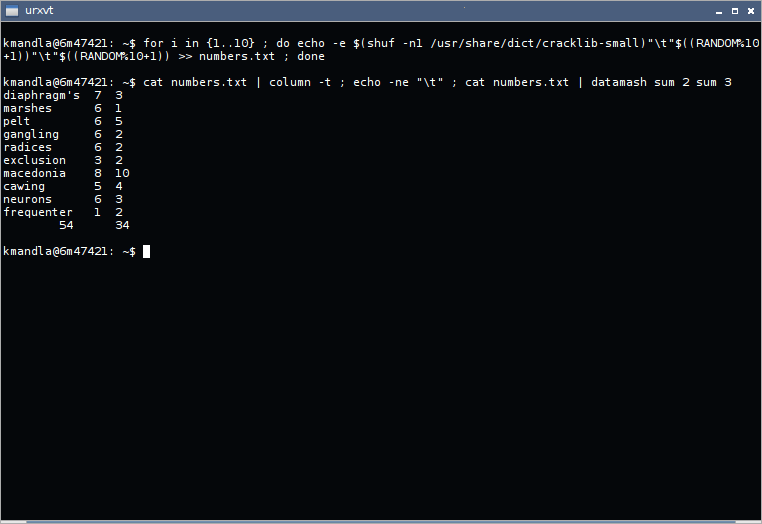 Both programs calculate IP information given a particular address, and return extended results. As far as I can tell neither one needed actual network access to accomplish that feat, so I believe they could be of use on an offline machine too. And it’s likewise obvious from looking at that screenshot, that there are some intricacies in the way both programs display their results. ipcalc is considerably more detailed (and colorful 😉 ), and pipcalc is considerably more succinct. Networking always has been, and probably always will be, a weak point for me, so how either of these tools — or sipcalc or prips, for that matter — are of practical use is a bit vague. This entry was posted in Linux and tagged calculator, information, network on 2014/09/12 by K.Mandla. I will apologize first, for the long lapse in communication. The end-of-season workload in real life took over late last week, and very foolishly I did not make preparations for posts during that time. I should have; I knew it was coming, but I acted all surprised when I suddenly had no time for the things I enjoy — like picking around at software. But it should all be okay now. At least I have a better handle on real life responsibilities. That’s impressive for a one-shot command-line expression evaluator — or calculator, as some like to call it. Hand just about any expression to e and it will click and sputter briefly before throwing out an answer. And not just simple math either. All these things are legitimate e commands. For its size and its potential, e should be an addition to just about any system. No more mucking around with bc while trying to balance your checkbook. e can solve it all in a fraction of the time, and take up no more space than a postage stamp. And if you enjoy math logic, the home page has an interesting (and convincing, from my uneducated perspective) treatise on why zero is not a number and why just a plus sign — “+” — should evaluate to zero. I’m a believer now. This entry was posted in Linux and tagged calculator, math, mathematics on 2014/08/18 by K.Mandla. After more than a year and a half of tinkering with random console programs, I know enough to look forward to fun stuff out of coreutils. Here’s factor, which I admit has almost no explicit function beyond showing the prime factorization of a number. Which is absolutely correct, of course: 2x3x4x5 does in fact equal 120, and factor is nice enough to group similar factors for readability. But that’s all it does. So what’s the big deal, K.Mandla? rather than just a string of 16 number 2s. Call me picky. First let’s lose the colon-plus-space arrangement, and kick in a tab character instead, for reasons that will be clear in a moment. sed can help with that. I’d prefer a tab character there only because cut likes tab characters as delimiters. Now we just need to break off each number where a space appears, and we can call in some heavyweights. sed again, just for kicks. Four twos, two threes and a five. Yup, that’s right. That’s 720. uniq counted the lines and gave a total. Too much whitespace at the front though. And it would be nice if there was just a multiplier mark between the count and the factor. for more complete (replete?) results. This entry was posted in Linux and tagged calculator, math, mathematics on 2014/08/14 by K.Mandla.